The concluding chapter examines the implications of the discussion in the book for Muslims in Britain and other countries in the West. The conclusion in exploring future challenges highlights the experiences of Muslim communities across Europe and the USA, where similar policies of surveillance and insecurity continue to implicate innocent Muslims. The ‘everyday’ accounts in this study are linked to narratives of Islamophobia that have emerged elsewhere in the West, revealing the limitations of securitizing entire Muslim communities. 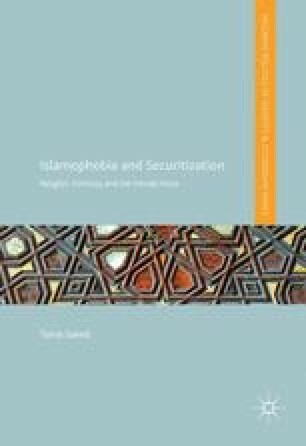 In summarizing the discussion in the book in light of recent developments across Britain, Europe and the USA, the Conclusion illustrates how, as a consequence of securitization, Islamophobia is increasingly becoming an unchallenged and acceptable part of the British and Western social psyche. American Civil Liberties Union (ACLU). (2015) Factsheet: The NYPD Muslim Surveillance Program. Available from: https://www.aclu.org/factsheet-nypd-muslim-surveillance-program (Accessed 03/01, 2016). BBC News. (23/07/2011b) Belgian ban on full veils comes into force. Accessed from BBC News. [Online]. Available from: http://www.bbc.co.uk/news/world-europe-14261921 (Accessed 09/15, 2012). Brown, K.E. (2011) Gender matters, soundings policy matters for Muslims in Britain. Muslim Council of Britain. [Online]. Available from: http://soundings.mcb.org.uk/?p=44 (Accessed 08/03, 2012). Buchanan, R.T. (24/11/2015) British Muslim women filmed glorifying Isis and urging Muslims to ‘reject democracy’ in undercover investigation, Independent. Available from: http://www.independent.co.uk/news/uk/home-news/british-muslim-women-filmed-glorifying-isis-and-urging-muslims-to-reject-democracy-in-undercover-a6746226.html (Accessed 01/02, 2016). Carter, H. (03/08/2012) Shafilea Ahmed: the murder that tore her family apart. The Guardian. [Online]. Available from: http://www.guardian.co.uk/uk/2012/aug/03/shafilea-ahmed-murder-background?intcmp=239 (Accessed 02/03, 2013). Collective Against Islamophobia in France (CCIF). (2016) Report 2016. Available from: http://www.islamophobie.net/sites/default/files/CCIF-Annual-Report-2016_0.pdf (Accessed 03/01, 2016). Dizard, W. (09/12/2015) US Muslims experience rise in Islamophobia, Al Jazeera America. Available from: http://america.aljazeera.com/articles/2015/12/9/us-muslims-experience-surge-in-islamophobic-attacks.html (Accessed 03/01, 2016). Jones, A. (25/11/2015) Female British IS supporters preach hate in front of kids in undercover documentary, The Sun. Available from http://www.thesun.co.uk/sol/homepage/features/6762859/Female-British-IS-supporters-preach-hate-in-front-of-children-in-undercover-documentary.html (Accessed 02/01, 2016). Marcotte, A. (10/02/2016) GOP Islamophobia: Two-thirds of New Hampshire Republican primary voters want to ban Muslims from entering U.S, Salon. Available from: http://www.salon.com/2016/02/09/gop_islamophobia_two_thirds_of_new_hampshire_republican_primary_voters_want_to_ban_muslims_from_entering_u_s/ (Accessed 03/01, 2016). Open Society Foundations. (2015) Islamophobia in Europe. Available from: https://www.opensocietyfoundations.org/explainers/islamophobia-europe (Accessed 03/01, 2016). Safdar A. (18/02/2016) France state of emergency ‘extended on slim evidence.’ Al Jazeera. Available from: http://www.aljazeera.com/news/2016/02/france-state-emergency-extended-slim-evidence-160217174759408.html (Accessed 03/01, 2016). The Huffington Post. (13/04/2012b) Pakistani students made to take face-to-face interviews for UK study visa. The Huffington Post. [Online]. Available from: http://www.huffingtonpost.co.uk/2012/04/13/pakistani-students-interview-uk-study-visa_n_1422884.html (Accessed 02/04, 2013). Tonkin, S. (23/11/2015) Revealed: Three British women ISIS supporters who are spreading extremist ideology in UK and encouraging young girls to join the jihadists in Syria, The Daily Mail. Available from: http://www.dailymail.co.uk/news/article-3330855/Three-British-women-exposed-ISIS-supporters-spreading-extremist-ideology-UK-encouraging-young-girls-join-terrorist-group-Syria.html (Accessed 03/02, 2016). Urquhart, C. (27/03/2013) Malala Yousafzai sells life story for a reported £2m. The Guardian. [Online]. Available from: http://www.guardian.co.uk/world/2013/mar/27/malala-yousafzai-life-story-2m (Accessed 04/01, 2013). Wellman, A. (23/11/2015) “British women filmed ‘urging young girls to join Islamic State terrorists in Syria’” The Mirror. Available from: http://www.mirror.co.uk/news/uk-news/british-women-filmed-urging-young-6887691 (Accessed 03/01, 2016).